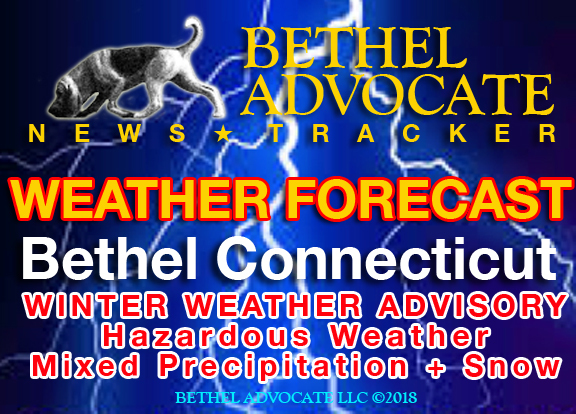 The National Weather Service has issued a Winter Weather Advisory for southern Connecticut, northeast New Jersey, southeast New York and other areas. A wintry mix of precipitation, which may begin as early as late Monday night, is expected Tuesday and Tuesday night. There is a chance that the combined amount of snow, sleet and freezing rain reach levels that would eventually warrant a warning. Snow begins toward daybreak Tuesday morning for the NYC metro, and then works northeast across the remainder of the area. Potential high impact for the morning commute. Precipitation transitions to a wintry mix during the late morning and afternoon hours from south to north. There is some uncertainty with how quickly this transition occurs. Small timing differences will have significant impacts on snowfall and ice totals. Snowfall totals of 1-4 inches along the coast and 4-7 inches inland are forecast before changeover. Highest amounts in the watch area. A light ice accretion near the coast with a tenth to quarter inch well inland. Rainfall amounts of 1 to 1 ½ inches with locally 2 inches. SNOW: Late Monday Night through Tuesday afternoon. Precipitation will transition over to rain at the coast by late afternoon/early evening with gradual transition through the night across the interior. FREEZING RAIN: Ice accumulation of a tenth to quarter inch inland with a few hundredths elsewhere. Falling power lines and tree branches possible. Interior NE NJ, the Lower Hudson Valley and interior Southern CT, Lighter amounts elsewhere. Tuesday Afternoon through Tuesday Evening. HEAVY RAIN: 1 to 1 ½ inches, locally 2 inches. Minor Flooding of Urban Areas, Low-lying Roads, and Small Streams and Creeks. Entire Tri-State Region. Late Tuesday Afternoon through Tuesday Night. PRECAUTIONARY/PREPAREDNESS ACTIONS… A Winter Weather Advisory means that periods of snow, sleet or nfreezing rain will cause travel difficulties. Expect slippery roads and limited visibilities, and use caution while driving. Check local Department of Transportation information services for the latest road conditions. Mostly cloudy, with a high near 36. Wind chill values between 25 and 30. North wind around 6 mph. A 20 percent chance of snow after 4am. Cloudy, with a low around 20. Northeast wind 3 to 7 mph. Snow before 2pm, then snow and sleet. High near 30. Wind chill values between 10 and 20. East wind 8 to 13 mph, with gusts as high as 23 mph. Chance of precipitation is 100%. New snow and sleet accumulation of 3 to 5 inches possible. Freezing rain and sleet before 10pm, then rain and sleet between 10pm and 1am, then rain after 1am. Temperature rising to around 36 by 5am. Wind chill values between 20 and 25. East wind 6 to 14 mph, with gusts as high as 25 mph. Chance of precipitation is 100%. New ice accumulation of less than a 0.1 of an inch possible. New sleet accumulation of less than one inch possible. A 20 percent chance of rain before 9am. Mostly cloudy, with a high near 43. West wind 7 to 15 mph, with gusts as high as 33 mph. A chance of snow before noon, then a chance of rain. Mostly cloudy, with a high near 47. Chance of precipitation is 50%. Rain likely. Cloudy, with a low around 38. Chance of precipitation is 60%. A 30 percent chance of showers. Mostly cloudy, with a low around 23.